Jarrett Hurd isn’t particularly pleased with how he fought against Tony Harrison. The result ultimately is what matters, and Hurd stopped Harrison in the ninth round to win the then-vacant IBF junior middleweight title February 25 in Birmingham, Alabama. Hurd understands, though, that some people probably aren’t quite sold on him after his victory over Detroit’s Harrison (24-2, 20 KOs). The undefeated fighter from Accokeek, Maryland, intends to convince critics Saturday night that he belongs among the elite fighters at 154 pounds. 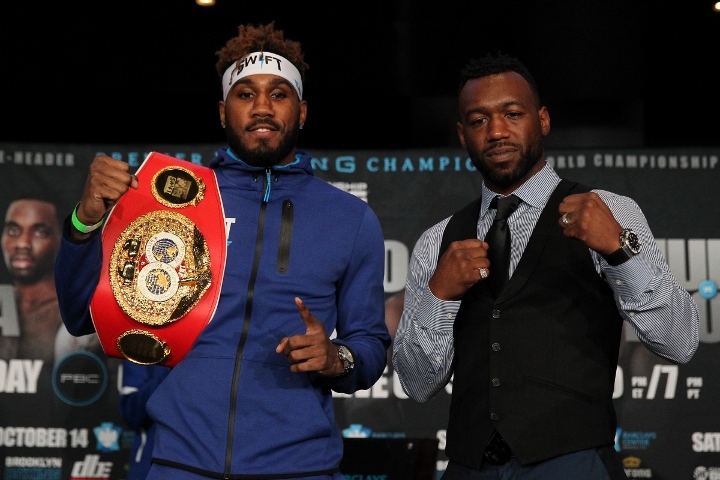 In his first title defense, Hurd (20-0, 14 KOs) will square off against Austin Trout (30-3, 17 KOs) in the first of three 154-pound championship matches Showtime will air from Barclays Center in Brooklyn (10 p.m. ET/7 p.m. PT). “A win over Austin Trout is gonna solidify me at the top of the division, with the other guys,” Hurd told BoxingScene.com. “He has losses to all former world champions and he’s never been stopped. So I feel like a win over Austin Trout would put me up there with those guys. Trout, a former WBA super welterweight champion, has lost only 12-round unanimous decisions to Canelo Alvarez (49-1-1, 34 KOs), Erislandy Lara (24-2-2, 14 KOs) and Jermall Charlo (26-0, 20 KOs). The 32-year-old southpaw figures to be the best opponent Hurd has fought since he turned pro five years ago. The Las Cruces, New Mexico, native hasn’t fought in 16 months, not since losing to Houston’s Charlo in their May 2016 title fight in Las Vegas. Hurd won the title Charlo vacated to move up to the middleweight division. Hurd was beating Harrison by slim margins on two of three scorecards when their fight was stopped 7½ months ago at Legacy Arena. The 27-year-old Hurd is proud he was able to become a world champion, yet realizes he’ll have to perform better to beat Trout. “I do feel like my last fight against Tony Harrison was not my most fundamentally sound fight,” Hurd said. “But it’s the way I had to fight. I had to fight a way I’m not too comfortable fighting, but I still got the job done. As you can see, I’m a natural counter-puncher. My best performance was against Frank Galarza. Me being the bigger fighter, the longer, rangier fighter, they’re trying to stay away from my power. So I have to switch my style up and walk opponents down. WAR Hurd !!!!! Hurd is too big for Trout....Hurd is going to catch a trout.